Home » Blog » How can you Improve the Effectiveness of your Sales Meetings and Seal the Deal Quicker? Is social selling a good excuse for not visiting customers? How can you Improve the Effectiveness of your Sales Meetings and Seal the Deal Quicker? The sales meeting is a quintessential rite of passage for all salespeople (to prove the point, see our previous article about social selling). Despite the Internet’s ubiquitous status in our era, meetings have never been more important to ensure mutual understanding. And, obviously, argue in favor of your product. In this article, we will see how sales meetings can be made more effective by drawing inspiration from books on the topic, interspersed with real-life anecdotes. 1. Face-to-face meetings are a linchpin in sales: mastering the aspects involved is crucial. 2. There is no such thing as a natural-born seller, but some people can learn to sell well. 3. The key moments in a sales meeting are the preparation, the first few minutes, listening to the client and closing the deal. The sales meeting remains an indispensable part of selling. Even though technology and devices easily allow remote communication, nothing beats a one-on-one meeting that enables you to converse directly with your client. This type of meeting is the most important moment in a sale and a crucial time in the life of the salesperson: the customer’s needs, desires and fears have to be analyzed and satisfactory responses must be found. And, of course, closing the sale, because that is the ultimate aim. After much effort, the salesperson finally comes face to face with the customer of their dreams. The dozens of blockading secretaries have been dodged and an incredible number of impromptu visits and fruitless emails were needed to get this meeting. This opportunity cannot be wasted. An ill-prepared presentation, often due to time constraints, leads to the sale falling through and hopes being dashed. There is no secret recipe for this. But it does take self-discipline, willpower, positive thinking, self-confidence, constant work, team spirit and, in particular, building a real sense of a relationship (see the checklist on p. 30 of the book). 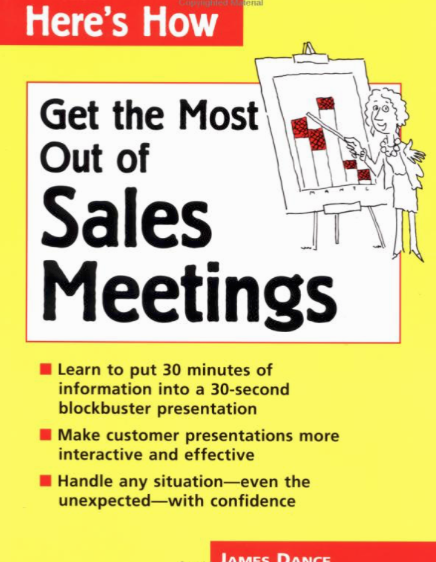 We first have to dismiss a myth: you cannot wing a sales presentation. This does not always mean spending ten hours with your nose in a file, but you should at least take the time to calmly look over the presentation. It is also necessary to have carried out research, prepared the opening, sales strategy and pitch, without forgetting to leave good time for listening to the client’s concerns, needs and questions. Of course, you have to be able to react, respond and improvise when necessary, but relying on improvisation in a cavalier attitude won’t get you very far. Nowadays, it is very easy to search for information on a company and its directors, but such ease can be misleading. A lot of information about companies is hidden. An increasing number of decision-makers, as described in our previous article, have fled from social networks to hide from sellers. So, the background work is more important than ever. Once I realized that I had to prepare my presentations and, where possible, ask for help from my more experienced colleagues, my sales meetings improved drastically and I was able to make some sales as a result. Sometimes, a relaxing hour in a café before the appointment allowed me to plan my line of attack. Only the most hard-working people manage to improvise convincingly. Beginners are not able to ad-lib, only those who have practiced can give themselves the luxury of being inventive. Henri Jeanson once wrote, “First impressions are always good, especially when they’re bad.” This is another aspect about which I learnt a lot in the field because, under the emotional distress of being a beginner and also due to the lack of preparation, I usually had clammy hands. Fortunately, my sales manager gave me some very useful advice: just before shaking hands, I should discreetly rub my hand on my trousers and then firmly shake hands to avoid any impression of nervousness or of being a dead fish. Having sweaty palms is obviously no crime but it will inevitably convey a feeling of inferiority, which does not bode well for the rest of the meeting. Other aspects at the sales meeting have their own significance. 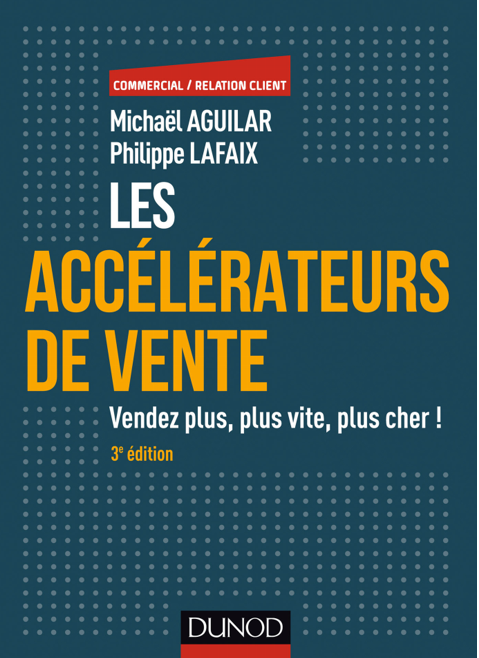 In their sales bible, “Les accélérateurs de vente” [Sales accelerators], Michaël Aguilar and Philippe Lafaix rightfully remind us that the title held by the sales person, and even the business card, are not trivial matters. It should be noted that on page 39 the authors describe the reverse approach that is often used by clubs and VIP associations, whereby the seller reverses the power dynamic and explains to the potential client that joining the club in question requires a period of reflection to properly study the application and assess whether the client is a suitable candidate for the club. If the job of the salesperson is difficult, the life of the client is not clear sailing either. A good seller needs to learn empathy, to be able to understand the other person’s profession. As I have been on both sides of the sales pitch, I can explain the buyer’s perspective. Contrary to what is often said, the buyer’s actions are not governed solely by rationality. The buyer has their own career path, internal problems, resistance to change, organizational or budgetary problems… All this means that the buyer’s mind is completely elsewhere when the salesperson walks through the door. The numerous salespeople who came in with their PowerPoint presentation on the history of their agency made me feel that they were more concerned about themselves than about my problems. What was keeping me up at night was my projects and the problems I encountered in rolling them out. When I met a salesperson who came with an attentive ear and suggested a solution to a problem that they had come across before, I was much more likely to make an order. Such sellers are few and far between. Try to remember what Regis McKenna once said, “you have to always start from a blank page.” This allows you to show you are actually listening to your clients’ problems. And when it’s sincere, it’s all the more powerful. Alec Baldwin’s excellent monologue (“Always be closing!”) in Glengarry Glen Ross comes to mind. A scrupleless sales manager “motivates” a sales team, some of whom (Jack Lemmon) have problems back home, but ends up berating them with a warning that two of them will be fired. Despite this caricature, the closing is the most crucial part of sales, especially a well-conducted sales presentation. The authors give an example of the sale of office equipment where a question asked in a negative form leads to a 31% success rate. The figure rises to 39% when the question is put into a positive form. This is beaten further with 51% by a question giving a positive choice between two options. Instead of making an offer that ends with a yes or no, it is possible to demonstrate a series of relevant options that lets the client make their own decision from among the options. This is not only a selling technique, it is also a method to respect the client’s choice and let them opt for a solution that matches their needs. The client meeting is an art form that requires a lot of practice. The quality of the discovery and research phase before the presentation, and actively listening to the prospect are essential to enter the closing phase with relative ease. Michaël Aguilar explains that this latter phase is (all too frequently) the moment when the seller turns the screws on the buyer by handing them over to a manager. One day, my wife and I entered a furniture store. Once inside, we noticed that it was completely devoid of customers. A saleswoman immediately swooped in on us and, after a basic and fairly rushed pitch, had us sit down and called her manager, who tried to close the sale as fast as possible by putting us under pressure and knocking down prices at a staggering rate. Not only did we not buy anything but we have avoided the place ever since, like many others considering the crowd we saw there. It was a traumatic experience. B2B is not exempt from such ideas. As a customer, I have seen many sellers of this type in B2B; the pick of the litter being a salesperson who insulted me on the phone because I wasn’t able to make a decision (I was actually trying to get him off the line). We should not forget that the B2B sales meeting is like a marriage. There is a before and an after the sale, and the buying is often revisited after the fact. It is better to remain respectful and friendly and keep this advice in mind to be more effective in arranging client meetings. 10 Mistakes that Ruin a First B2B Sales Meeting… and How NEVER to Commit Them!